Discounts are available for dihydro dC (5-6 DHC)! 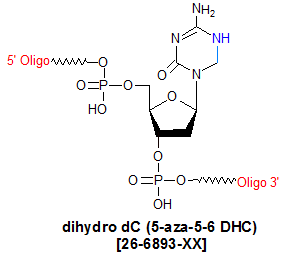 5-aza, 5,6-dihydro dC (5,6-DHC) is primarily used to modify oligonucleotides slated for use as tools in cytosine-5-methyltransferase research studies. Cytosine-5-methyltransferases are key enzymes involved in methylation of CpG motifs necessary for epigenetic gene regulation in a wide variety of living organisms (1). Defects in the regulation of this set of enzymes are implicated in cancer (2). The reaction mechanism for these enzymes generates a transient dihydrocytosine as a key intermediate. In an oligo modified with 5-aza, 5,6-dihydro dC, the modification acts as a transition-state mimic, and binds non-covalently to the enzyme�s active site with high affinity. As such, it functions as a potent inhibitor of cytosine-5-methyltransferases, which makes them an excellent tool for structural studies, and an attractive alternative to 5-fluoro-cytosine (3). 1. Bestor, T., Laudano, A., Mattaliano, R., et al. Cloning and sequencing of a cDNA encoding DNA methyltransferase of mouse cells. The carboxyl-terminal domain of the mammalian enzymes is related to bacterial restriction methyltransferases. J. Mol. Biol. (1997), 270: 385-395. 2. Beaulieu, N., Morin, S., Chute, I.C., et al. An essential role for DNA methyltransferase DNMT3B in cancer cell survival. J. Biol. Chem. (2002), 277: 28176-28181. Marquez, V.E., Goddard, A., Alvarez, E., et al. Oligonucleotides containing 5,6-dihydro-5-azacytosine at CpG sites can produce potent inhibition of DNA cytosine-C5-methyltransferase without covalently binding to the enzyme.Antisense & Nucleic Acid Drug Dev. (1999), 9: 415-421.